A planned exercise on board Manannan will take place in Douglas Harbour early next week. 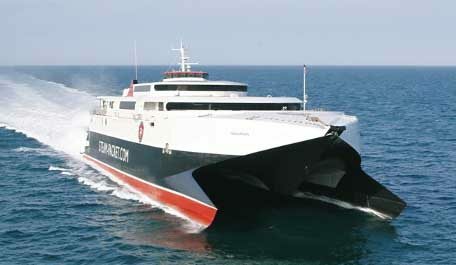 Three fire crews will be mobilised to the Isle of Man Steam Packet Company fast craft on the evening of Monday, 4th February where they will simulate extinguishing a fire on board, with the assistance of the ship’s crew. It’s designed to further develop their skills in how to respond to emergency situations, as well as offering island fire officers an opportunity to familiarise themselves with the vessel. The scenario will be based around a car deck fire with a trapped or injured casualty. It is expected the exercise will take approximately two hours. Chief Executive Mark Woodward explained: ‘We want to advise the public to avoid any confusion for anyone who sees the emergency services attending Manannan. This type of exercise is something we plan for from time to time and is both beneficial to the fire service and our crew. Manannan is currently moored on Victoria Pier in Douglas harbour before undergoing her annual overhaul ahead of services resuming on Friday, 29th March.